AMD's First Polaris GPU may be out in 2 months and will have higher clock speeds than AMD's current Fiji GPUs. 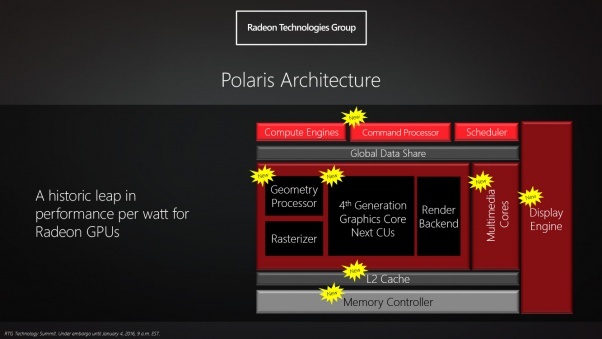 Read more on AMD's first Polaris GPU releasing in as little as 2 months. Didn't they say mid 2016? It is supposed to be a mid-range product, not the flagship. It looks more like they are comparing it to a 950 dude. yeah, but that was with artificial framerate locks etc to make it look very low power. not sure where in the product stack it will sit, but it will be low end, 960 replacement I imagine. @Mageoftheyear Nope, confusion there. I meant that the GPU was brought up from production after just 2 months. Just spotted this on my twitter feed. the article will be edited immediately. Unfortunately these kind of misinterpretations happen, especially at times like these when a lot of people in the industry are so busy. CES is madness, especially for those like Ryan who are in the thick of it.